Amazon is set to reveal a promotion this weekend which is raising eye brows. The online retailer asks that customers scan merchandise at local retailers using their mobile app. If you come back and buy that item from Amazon, the company will give you $5 off of each item you scan, up $15 total. One of the more contentious realizations made is that this also includes local book stores, businesses who are already being strangled by Amazon's growing tendrils of e-commerce. The special promotion is said to be good for any item available on the company's site which covers one of the largest and diverse inventories on our fair planet. Although sources single out Amazon's "Price Check" app as the software to use, there is little reason to believe that Amazon's full featured "Amazon Mobile" app with its integrated bar code scanning function would not work also. For now though, let us assume Price Check is the best app to use. As good as this may sound to the ears of most customers, physical retailers are up in arms over Amazon's promotion. The American Retail Industry Leaders' Association issued a statement which lambasted the company for leveraging its "pre-Internet tax loophole" in order to effectively poach customers at the point of sale. The organization then used the Price Check app as a clear example of why Congress needs to act quickly in order to protect local retailers. "A failure to act is an implicit endorsement of a subsidy of Amazon." a spokeswoman said. In an earlier interview with the managing director of Waterstones, James Daunt said: "They never struck me as being a sort of business in the consumer's interest. They're a ruthless, money-making devil." He continued, "The computer screen is a terrible environment in which to select books. All that 'If you read this, you'll like that' – it's a dismal way to recommend books. A physical bookshop in which you browse, see, hold, touch and feel books is the environment you want." The promotion should begin this Saturday. 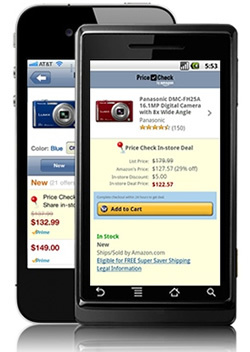 Amazon's Price Check app is available for iPhone and Android while Windows Phone 7 will have to hope the Amazon Mobile app works just as well.